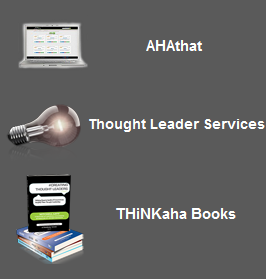 #LEADS to SALES tweet Book01 | THiNKaha: Become a recognized expert in your field of expertise. Compelling thought leadership content. Converting leads into sales can stump even star sales professionals. High-performing salespersons compare the process to having teeth pulled without Novocain or gargling bleach! So when Jim McAvoy, with a quarter century of proven performance in maximizing sales, collates his treasury of actionable wisdom, even successful sales professionals sit up and pay attention. McAvoy walks you through his proven L.E.A.D.S.™ process for lead conversion. He offers practical ideas to help you advance within the prospecting phase of the sales process, teaches you how to effectively engage both gatekeepers and targeted executives, and shares crucial principles that get you closer to the signed deal. Written in the popular tweet format,#LEADS to SALES tweet Book01 is a veritable treasury of sales wisdom, will set you firmly on the path to stellar sales. We have a 100% satisfaction guarantee. If you’re not satisfied with the book you receive, please let us know and we’ll refund your money. For book art, author pictures, or affiliate links, visit the Media Resource page. Converting a lead into a sale can stump even star sales professionals. High-performing salespersons have compared the process to having teeth pulled without Novocain or gargling bleach! So when <i>Jim McAvoy</i>, with a quarter century of proven performance in maximizing sales, collates a treasury of actionable wisdom, even the most successful sales professional needs to sit up and pay attention. #LEADS to SALES tweet Book01 is just that–wisdom that you can deploy today, in a format you can digest. And it deals with a subject that has come to occupy center stage, especially in the last couple of years. Let’s step back a little bit–lead generation and lead nurturing have always been important to the sales process. Sales professionals for decades of recent history have fretted about the robustness of their pipelines and about the need to stabilize and accelerate the process, from that first cold call to signing off on the deal. But only in the last few years has lead generation really occupied so much of our attention. That’s because although technology has made it easier to gather leads, classify them, and maintain them in dossiers and the rest, it has not really helped significantly increase the conversion of sales. 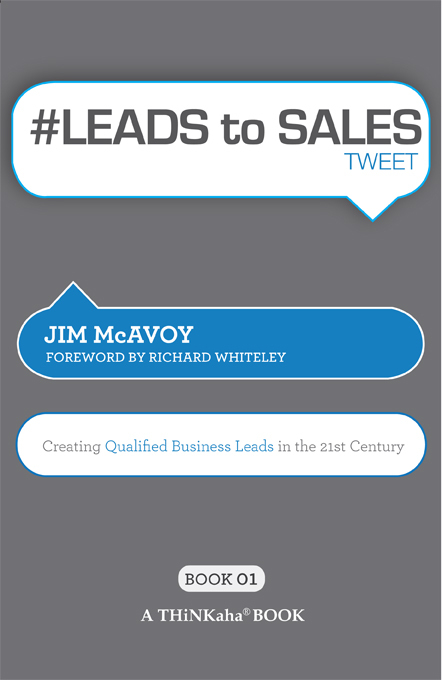 Aptly, the critical question that Jim McAvoy explores and provides answers for is: how do sales professionals reliably increase their reservoir of qualified leads and ultimately convert them to revenue? A significant portion of #LEADS to SALES tweet Book01walks you through the author’s proven L.E.A.D.S.™ process for lead conversion. He expounds on each of the five components of the process, showing you ways in which you can implement it into your lead generation and conversion flow. He also offers practical ideas to help you advance within the prospecting phase of the sales process, teaches you how you can effectively engage those all-too-formidable executive gatekeepers, and shares with you seven crucial principles that will get you closer to that all important document–the signed and sealed deal. Written in the increasingly popular tweet format, this veritable treasury of sales wisdom will set you firmly on the path to shorter cycle times and stellar sales. 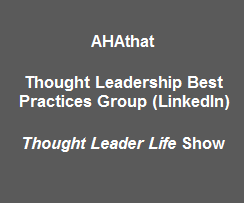 #LEADS to SALES tweet Book01 is part of the THiNKaha series whose 112-page books each contain 140 innovative and inspirational ideas (tweets/ahas). #5 Prospecting is like doing daily sit-ups and push-ups. Everyone knows they are good for you, yet most people do not want to do them. #28 Create an environment where you know if you are winning or advancing on a weekly basis. #93 Call between 7:30 and 8 a.m. and 5 and 6 p.m. because assistants are typically not in the office to intercept calls. #103 Avoid pointing out a client’s shortfalls—they already know about them. Instead, focus on conduits for success. #137 Consider contacting your prospects every other month with something of potential interest. Awareness counts. Founder and president of JWMcAvoy & Company, Jim McAvoy has almost twenty-five years of experience maximizing sales results for clients in a wide range of industries from boutique firms to Fortune 500 companies. An expert in lead generation, he has helped his clients secure an astonishing $60 million of incremental revenue to date! McAvoy holds a BA in Economics and History from the College of William & Mary. He was honored with the Certified Employee Benefits Specialist (CEBS) designation, a status conferred by a partnership of the Wharton School of Business and the International Foundation of Employee Benefit Plans. A succinct capabilities overview is available on his home page, at www.mcavoyleads.com.